Gregory and Caryn Katz are dwarfed beneath the cantilevered concrete overhang, which houses the bedroom on the upper level. The stackable glass doors that run beneath allow the house to open completely to the yard and swimming pool, soften the severity of the concrete, and blur the boundary between indoors and out. "I’ve never understood the distinction between domestic and commercial architecture,” says South African architect Gregory Katz. 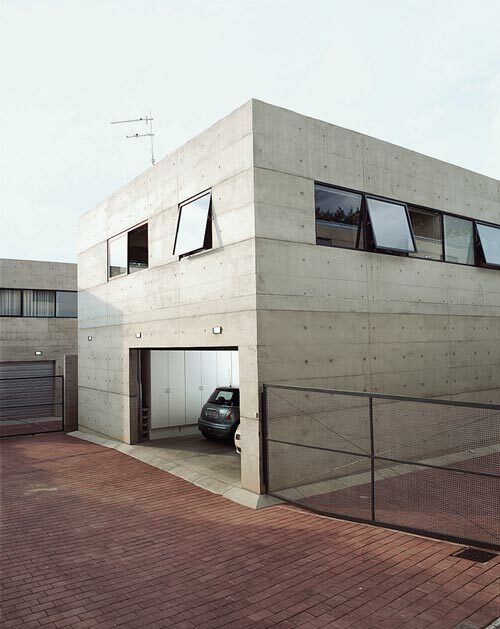 “A lot of what I do is an attempt to use engineering materials in a domestic setting in a new, clever way.” One of essentially three identical concrete boxes, the Norwood home Gregory moved into months before marrying his actress wife, Caryn, cuts an incongruous but captivating sight in this leafy middle-class suburb of Johannesburg. The trio of houses contrasts with the area’s mishmash of architectural styles, where a glut of security complexes are characterized by cookie-cutter design and little space in between. 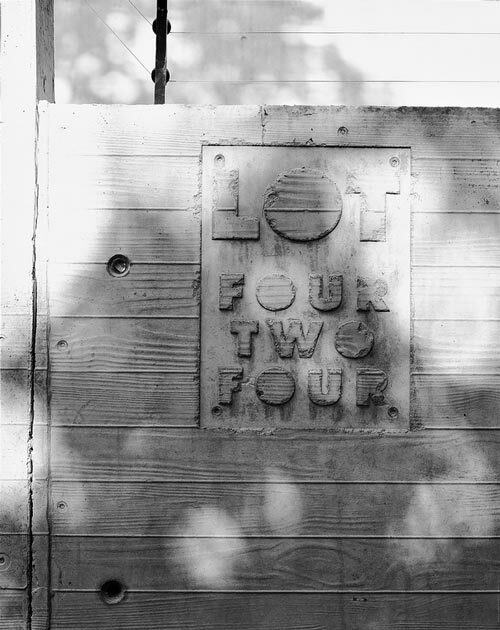 The three 3,660-square-foot dwellings at Lot 424 share over a third of an acre and answer a common desire for space, security, shared maintenance, and even a sense of community. Achieving this in an economical fashion wasn’t easy, but for Gregory, who thrives on the research and development side of a design project, it was all part of the process. 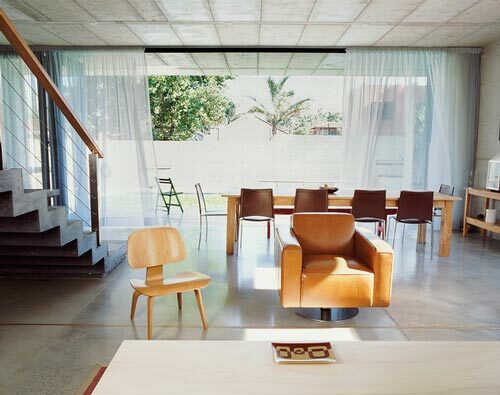 “I love the solidity, strength, and neutrality of off-shutter concrete,” says Gregory. “You can build pretty quickly with it, and the absence of fittings and finishes made the economics convincing. It wouldn’t be cost-effective for one house but it is for three,” he explains. Taking just 18 months to build, the units are designed with a shared-access service road that runs down the back of the buildings and, at 20 feet wide, is big enough to drive cars down and provide off-street parking for visitors. “Each unit is designed so that the more open side of the house looks onto the private sides of the neighboring houses,” explains Gregory. The slope of the ground facilitates this too, with each unit stepping down a bit so that none of the windows correlate. For Gregory, Johannesburg is a great place to be an architect. Its origins as a swashbuckling gold-mining city where fortunes were quickly made and lost resonates even now, most notably in its architectural landscape where developers are all-powerful, and buildings go up and come down with little regard for longevity or the preservation of architectural value. “It’s an exciting place to be as there’s much to be done, but it’s not for the fainthearted,” says Gregory, who started his own architectural practice four years ago�three years after returning to South Africa. “You have to work within what is achievable in this country. I tend to work closely with the builders, which eases the process. In fact, with this house, the builder ate most of the cost of the experimentation on the staircase, as he was just as passionate about getting it right.” After three attempts, strength-tested in situ each time, Gregory is particularly pleased with the high-tech result, achieved using a composite system of welded steel L-profiles, expanded mesh, and polymer fibers in the concrete. 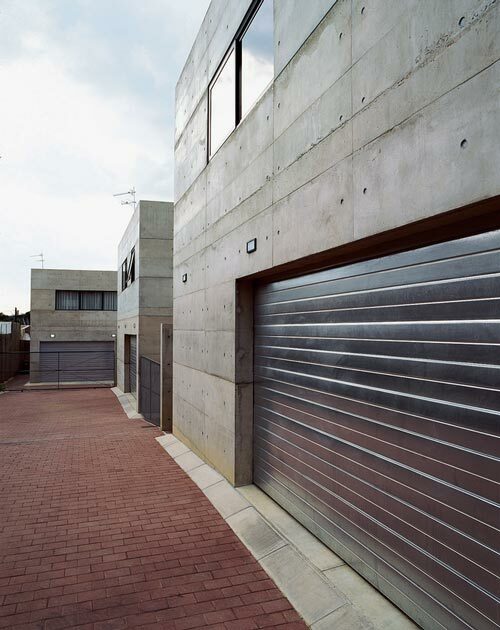 It was a similar journey with the concrete finishes, starting with the boundary wall, for which they used heavy-grain timber as shutters so that the resulting molded concrete retains the impression of the timber grain. They also used laser-cut Perspex to imprint text on walls, inspired by an old technique that Le Corbusier used in the 1930s. 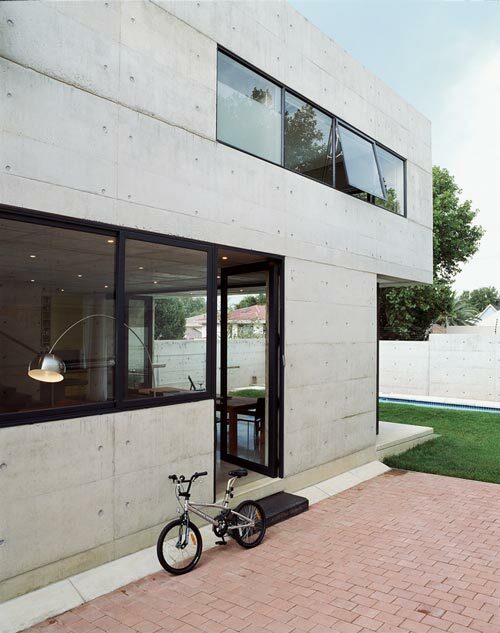 “There’s an alchemy to concrete that allows it to take on many guises at very little cost,” says Gregory. 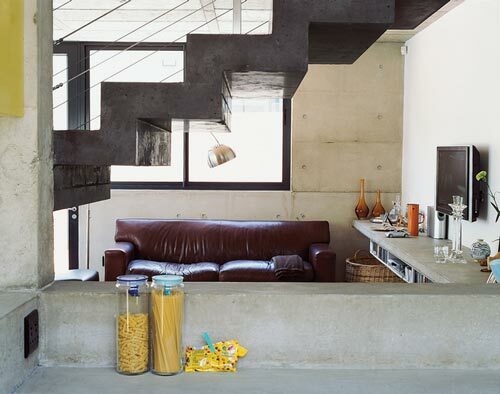 The concrete staircase is pigmented black, a durable choice for a high-traffic area that can withstand nicks and scratches, and the slab on the terrace has been ground to expose the black flecks of Johannesburg granite used as an aggregate. Concrete countertops in the kitchen have been finished simply with an invisible sealant while the windowsills in the bedrooms form deep slabs to resemble floating shelves. The house has also been designed to be thermally efficient with the overhang on the terrace carefully calibrated to avoid the summer sun but capitalize on it in winter, when the sun is lower and the light comes through the huge glass doors in the living area. “Our Highveld winters are good because they’re sunny, so the concrete absorbs heat during the day and gives it off at night,” notes Gregory. 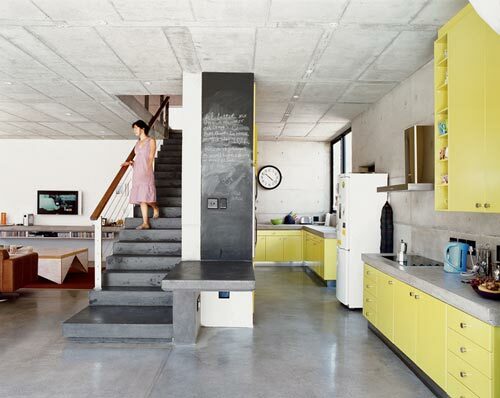 The radiant heating is also embedded directly into the slab of concrete. 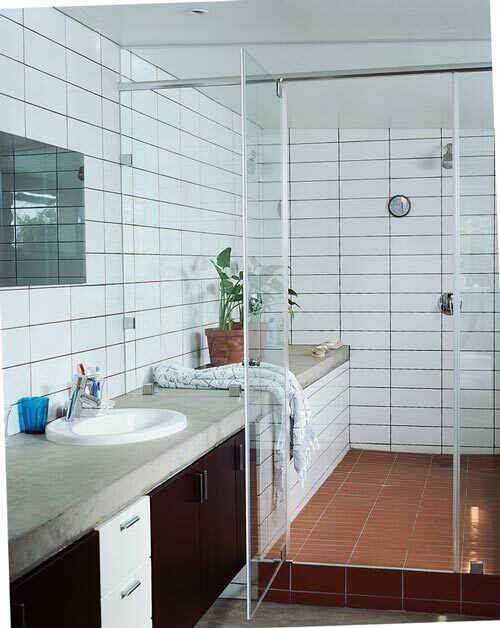 In summer the big openings and cross ventilation ensure a thorough flow of air throughout the house. They both marvel at how grown-up the house feels in comparison to their previous Art Deco apartment. “At first I thought I was moving into a mission statement for Gregory’s head, which was a little intimidating,” Caryn muses. “It’s taken a while to get used to it, but I’m surprised at how quickly I’ve managed to make the space my own. What I hadn’t anticipated was how the house makes all my little personal details like photos and tablecloths look quite spectacular. In our previous space they just blended in, but here they stand out. I really like that.” And when you consider the marital harmony this must afford, it’s the design’s most impressive accomplishment to date.